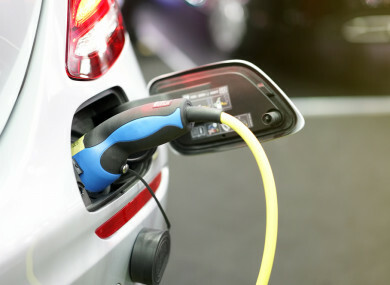 FROM TODAY, BUYERS of both new and secondhand electric cars will be able to avail of a government grant to install a charger for the vehicles in their home. The grant will support the cost of installing a home charger for an electric vehicle up to a maximum of €600. There are over 3,500 electric vehicles currently in Ireland, but the government wants to significantly increase those numbers in the years to come. Minister for Communications, Climate Action and Environment, Denis Naughten said this is just the latest measure to boost the sale of low-carbon cars. Other measures announced in Budget 2018, include the electric car purchase grant of up t0 €5,000, VRT relief of up to the same amount as well as new benefit in kind rate of 0% for battery electric vehicles for a minimum of three years. The minister is also adamant that he wants to press on with the move to ensure that electric cars will not have to pay road tolls. Naughten previously told TheJournal.ie that there are a lot misconceptions about electric cars. “It’s something we have to overcome,” he said, pointing out that the range anxiety most people have about electric cars just doesn’t apply to regular drivers who are commuting in and out of Dublin each day. With the launch of this new scheme today, the minister said home charging is convenient, practical and allows electric car owners to charge their cars overnight. However, for owners without access to home chargers, a network of nearly 900 public charge points are available, with additional public charging points being rolled out in the year to come. “I am working with the Minister for Transport to ensure that all new passenger cars sold in Ireland from 2030 onwards will be zero emission vehicles. The supports we put in place now will help us to achieve this,” said Naughten. He added that it is important that the public is aware of the benefits of electric cars, and for this reason the government is funding a public engagement programme this year which will include the opportunity for test driving road shows nationwide. There will also be a series of public sector and commercial fleet trials, as well as supports for electric vehicle use in car sharing trials. The minister also plans to give a grant for taxi, hackney and limousine car hires that choose to use electric vehicles. While today’s home charger grant scheme has been largely welcomed, Fianna Fáil’s Timmy Dooley said it must be recognised that significant hurdles remain to be overcome for those looking to convert to electric vehicles. He called for improved incentives, such as the removal of motor tax on electric vehicles for five years and the elimination of motor tolls for five years. “Ireland’s current target under the EU Renewable Energy Supply Directive is to ensure that 10% of its transport energy comes from renewable sources by 2020. Unless we dramatically increase the widespread use of electric vehicles, Ireland risks failing to meet this target and will be subject to fines from the European Commission,” said Dooley. Email “From today, you can now get a bit of cash to install an electric car charger in your home ”. Feedback on “From today, you can now get a bit of cash to install an electric car charger in your home ”.